One of the biggest wedding trends of the year is finding ways to incorporate social media. Brides everywhere are taking advantage of this skyrocketing form of communication to add a little something extra to their big day. Cameras on smartphones are more advanced than they’ve ever been. With this power in hand, attendees are capturing moments on their devices throughout your entire wedding! A hashtag can be used on any photos or statuses on Instagram, Twitter, or Facebook. Instagram has even made an option for filming short video clips so that the guests can share a first dance, the vows, or any moment worth rewatching. There are sites where you can order your Instagram photos printed in high quality. Your friends and family will be able to help you remember the day from all different views. Creating a personalized hashtag, such as #SmithandJohnson #MrandMrsJohnson or #johnsonwedding14, will ensure you’re able to see all these extra pictures being taken of your wedding. 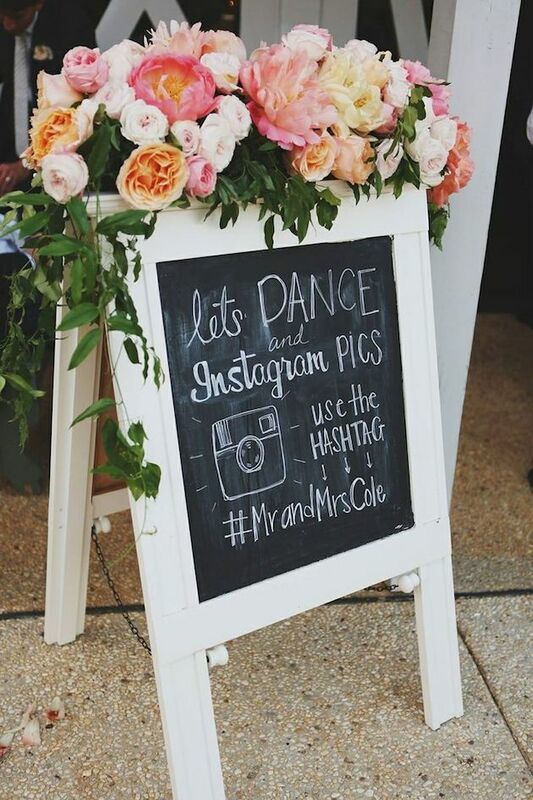 Once you have created your own hashtag, you can make it known by adding it to your wedding program or by making signs. On your sign, possibly framed or on chalkboard (another big trend this year), ask people “If you instagram or tweet use our hashtag.” Make sure to use the hashtag both prior when making posts that are wedding related and even way after the wedding when you are doing “throwback thursdays.” More ideas for making your hashtag known in a decorative way can be found on Pinterest. If you don’t want to clog the feeds of fellow social networkers, there are other options for wedding pictures. Having your own wedding app, Facebook page, or Flickr page is a great way to have guests share pictures more privately. Making a Facebook page for your wedding has a lot of advantages and is highly recommended. It’s so simple. Make the page private and invite all your wedding guests. This is a great atmosphere for everyone invited to chat or share pictures. Posting your photographer’s pictures to the page after the wedding will let the guests see the photos they are in. Also, you’ll have the ability to post the details of your wedding. This helps guests get information fast and efficiently when not having the invitation on hand. A Facebook page will also make RSVPs super easy for both you and your guests. If you’re inviting a more tech savvy crowd, consider making an app for your wedding. There are lots of different websites that will help you create your own, personalized wedding app. These app building websites will let you post details of the event. A lot of these websites will allow your guest to be able to post photos and comments on the app. A few are WedPics.com, WeddingPartyApp.com, and AppyCouple.com. Many of your guests may be traveling and unfamiliar with your wedding destination. It’s beneficial to your friends and family to make them a Pinterest board where you can post restaurants, things to do, and things your guest must see in the area. The link to the Pinterest board can easily be shared on a facebook page or wedding app. Your guest will appreciate the recommendations and the suggestions will make the trip well worth it. If you want to get really into this social media trend, you can even add a “social media station,” using a laptop and projector. People can tweet their congratulations to the couple and watch other tweets or pictures on the screen. Phone charging stations have become very popular this year as well. Also, using iPads to read wedding vows has become a preferred alternative to paper. Go ahead and don’t be scared to take advantage of what’s around you. Allow the rise of social media to benefit your wedding, assist your guests, and make memories.